Very cool topic. I’ve often wondered about the apparent size changes in the moon when moving past the horizon, but this is the first time I’ve read about the moon illusion. Also, that’s my name, don’t wear it out, ha! Haha seems like you’re a little down that Szczys is no longer the only 6-letter consonant string on Hackaday! Don’t worry, syzygy looses cool points for extra ‘y’s, you’re still the best. Stop it! It isn’t brighter! For the Moon to be brighter the Sun will have to be brighter. It just subtends a greater angle. If it was brighter from being closer to the Earth, then it would get brighter as space travelers approach it until they vaporize. But it doesn’t work that way. The Moon doesn’t receive more illumination from the Sun just because you are closer. The science reporting media is crammed full of these misconceptions (as well as ND Tyson in his Cosmos remake, In the first episode even). Yes, it is brighter, or at least we are recieving more moonlight per square meter since we are closer. That is not brightness. The increase from getting closer is exactly cancelled by the increase in apparent size of the Moon. The exposure in a camera for a photo of the Moon will stay exactly the same, just as for the eye. Regnirps is thinking of the amount of flux coming through an imaginary slice of the sky: there’s constant brightness per radian of moon. So yeah — point taken. Any given spot on the moon appears just as bright, it’s just that there’s more of these spots. Yeah, the moon itself isn’t brighter, but it APPEARS brighter from earth. No. If it appears brighter, what happens if you are 1/2 the distance? Then 1/16 the distance? On the surface? Consider the variation in the distance between the Earth and Mars. Does the exposure time through a telescope change with distance? Of you are 1/2 the distance, your retina will recieve about 4 times as much light. R^2 and all. If you are on the surface, the light would be equivalent to day time on earth, since the moon is roughly the same distance from the Sun. 4 times as much light spread over 4 times the surface area of the retina. Brightness is unchanged, just like film exposure. At all distances, the exposure for the Moon is a constant. Yesterday I had a conversation with a friend. She was convinced the ‘super moon’ appeared 30 times bigger than the size of a normal full moon. You should have asked her to demonstrate it. That site has the same error abut brightness. Give them a pencil and paper and ask them to prove it with some diagrams. If it were true you would have infinite free energy and perpetual motion. Did they say luminance or brightness, one is a metric the other a subjective perception. i.e. A little vocabulary is a dangerous thing. Look at it this way. If it were true that it gets brighter, then when you see someone standing in sunlight, as you walk toward them they will get continuously brighter. From some of the arguments put forward here, if they are 64 meters away, and you walk to within 1 meter, they will be over 4000 times brighter. That does not fit my experience. You will intercept 4000 times more photons bouncing off them per unit area of sensor. Sort of. Objects like the Moon don’t have any radiance, except in the far infra-red, and it is not evenly distributed on the surface. Magnitude is defined by an ideal stellar black body. Planets and moons in this discussion, on the other hand, are reflectors. Totally different problem. Good plan, change the argument to radiance when apparent magnitude specifically includes observed brightness whether reflected or not. Have you thought of running for public office? Planets and moons in this discussion are reflectors. Totally different problem. My wife and I took a walk together to see the moon. It was so super that we both hugged and wept. And I was inwardly cursing that i didn’t have a method on me to measure the absolute brightness and just put an end to any discussion on if it was brighter than average, or not. 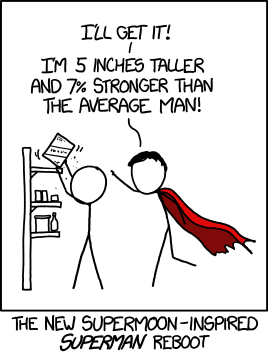 Have any studies been done on the perceived percentage increase in size caused by confirmation bias? But nobody believes he’s got normal sized hands no matter how many times he says otherwise. APOD image – great site – you should really bookmark it for a visit when you need a few seconds for yourself. Yeah, right? It was spectacularly clear here last night, and my 2 year old son was like “moon, moon, moon!” I wasn’t gonna rain on his parade. Can’t wait to drive up into the mountains for a good meteor shower. I did a Google search and there don’t seem to be many stories about super moon nonsense before about 2011. Now it seems there’s some nonsense about the moon several times each year. I can only conclude that someone realized moon nonsense would be a handy source of click bait for the web and time-filling b-roll on TV. Plus “send your photos of the super moon” audience participation. Or maybe it’s all a plot by Big Moon.